Market Research Archives - Page 3 of 18 - Solar Love! The state of New York provides a handful of solar power incentives, depending on where the solar power system is to be installed. For example, if it is to be located in the Con Edison service area, the incentive for a residential system would be between 20¢ and $1 per watt. So, if your home solar power system was 5,000 watts, you could get help from the state $1,000 to $5,000. If the incentive is 50 cents/watt, the state would provide $2,500. Then combine that with the federal tax credit, which is 30% through 2016, and the cost would be decreased considerably again. How much is the cost of a home solar power system in New York? A recent article pegged the cost at $4 per watt, so a 5,000 watt system would be $20,000, but with incentives, the cost would be about $12,000, depending on the state’s contribution. Is that price still unaffordable? What if you wanted a 7,000 watt system? It’s the same formula: $4 x 7,000 minus incentives. So, $28,000 minus about $10,000 is only $18,000, and that’s for a large home solar system. The more typical size seems to be 5,000 watts. The true cost will probably be even lower, though, because New York also offers a state tax credit for home solar power systems that is 25%. So, a 5,000 watt system could be less than $12,000 and a 7,000 watt system less than $18,000. For the 7,000 watt system, the payback might actually only be 4 years, because of all the incentives and the rising cost of electricity from utilities in New York. You might say that’s great for people with money, but not for low-income folks, but incentives for low-income homes can be double that of others. Increasingly, solar power is an investment with an attractive return — it is not just a ‘nice’ or ‘green’ thing to do. It is an investment that can make money, and real estate is a very common investment. In fact, a homeowner might first think of landscaping or updating the kitchen as ways to increase the value of a house. However, adding a home solar power system might be a better way. Remember the cost figure of $4 per watt for a solar power system? Well, if you could sell your house for an extra dollar amount that is about the same as the cost, the system might effectively be free. If you saved $1,000-$2,500 per year by generating your own electricity, how much would you have after 5 or 10 years? Five years of saving at $1,000 per year is obviously $5,000, so you would have made some money — and 10 years of savings at the same rate would be $10,000. That’s the conservative estimate. If you could save $150 per month, that would be $1,800 per year or $18,000 in 10 years. Who doesn’t want to increase the value of one’s own home and save money on utility bills? Solar panels can also help keep roofs cool in hot weather and slightly warmer in cold weather. So, you might need a little less air conditioning and heating. The amount of savings related to these effects will be very small, but they also should not be completely overlooked. Solar power typically has not been given credit for all of its benefits. Today, those include potential financial gains that had not been available a decade ago. The mindset that many Americans have today is that solar power is a good thing to do for the environment, but that it loses money. This view is simply untrue in a large number of case, maybe most cases. Today, because of the dramatic drop in solar prices, it could be something that is good for the environment and makes money. According to a new report, Appraising into the Sun: Six-State Solar Home Paired-Sales Analysis, adding a solar power system increased the value of homes in six markets. It also said that previous research, which found that home buyers would pay $15,000 a year more for a home with solar power, was confirmed. “These results will benefit appraisers, real estate agents, and mortgage lenders who increasingly encounter PV homes and need to understand the factors that contribute to, and detract from, market value,” explained one of the study’s authors, Ben Hoen, a researcher in the Energy Technologies Area of Berkeley Lab. The US Department of Energy SunShot Initiative helped fund the research. In fact, once all the tax credits and rebates have been accounted for, a home solar power system could actually be free — if you add in the boost in home value created by having such a clean electricity system. For example, a 5,000 watt home solar system might only cost about $15,000 after incentives. Obviously, if $15,000 in value was added to a home’s selling price, that increase would pay for the solar power system. If the home’s owners saved $150 a month on their electric bill, the yearly savings would be $1,800. In 10 years, the total savings would be $18,000. What other investment could you pursue that might make that amount of money in 10 years? Perhaps it is not surprising that some homes with solar power systems are not being appraised at their full value, though. “Many appraisers and lenders prefer the paired-sales valuation techniques that are standard in the real estate community, but comparable pairs of PV and non-PV homes are not always available, which can result in PV systems on some homes receiving no appraised value,” explained lead author Sandra Adomatis. Saving $18,000 in 10 years or $36,000 in 20 years would be very helpful to many homeowners. That money could also be used to cover home maintenance costs such as roofing, re-doing floors, painting, or landscaping. 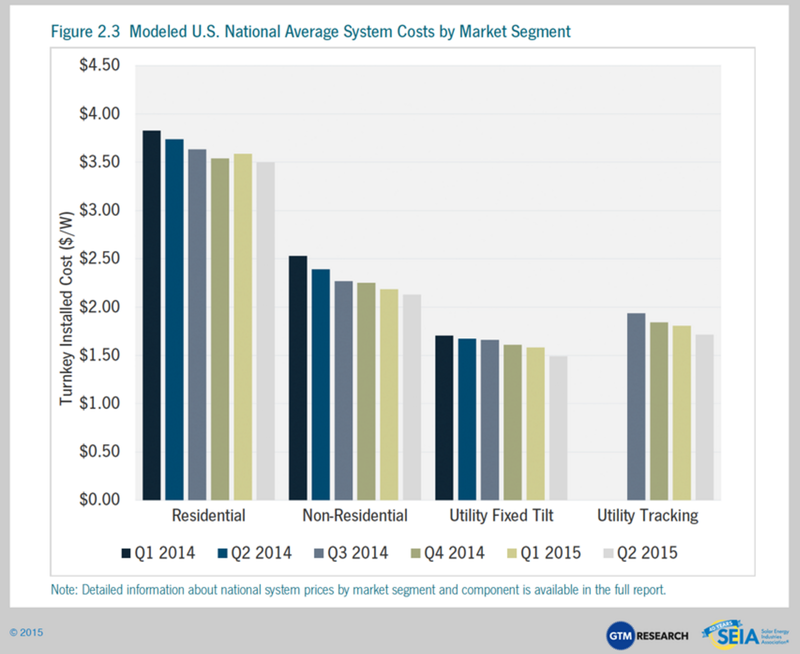 There seems to be a lot of confusion about how much a home solar power system costs in the year 2015. Solar Power Now says the cost is about $3 per watt, or $15,000 for a 5,000 watt system, which seems to be about the average size for a single-family home. Actually, the size of the system will depend upon how much electricity that home uses, so you might need less than 5,000 watts. Obviously, the benefit is that then you would pay even less. 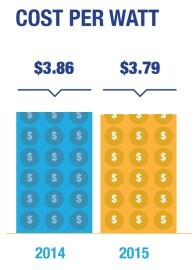 Did you know that solar power had dropped so much in price and become this cheap? Maybe not, because it does not seem that the public has caught up to the reality of what solar power currently costs. Even an official website managed by the state of California is using information from 2011. It says that the cost is $8.70 per watt and that a 4,000 watt system would cost about $34,000. A lot has changed in 4–5 years, but this website doesn’t reflect that. If you could purchase a home solar system in California for somewhere between $15,000–25,000, you still get to subtract some of that cost due to incentives like the solar tax credit, which is still 30%. Then, there might also be some local incentives, so the overall cost could be even less. Say your home solar system cost $20,000, but with the federal tax credit, that would be $14,000, and maybe lower with a local incentive. That incentive depends on where you live, because it can vary by location. All you have to do to find out is search DSIRE for solar power rebates or tax credits in your area. You can also search those terms in Google while including the name of your city or town, and you should be able to find some useful information. If that doesn’t work, you could call or email the government agency or department which handles home energy or solar power in your area — someone on staff there should send you the information. Installing a home solar system might seem like a ‘nice’ thing to do for the environment, but it now is more about the financial benefits for many consumers. For example, in Los Angeles, doing so could actually result in a return-on-investment of 215%, according to one source. The payback period was also fewer than 10 years, not 25 or 30, which is what some in the media seem to think it routinely is. This very long payback period is actually a thing of the past now that solar panel prices have dramatically dropped. We might have heard of the environmental benefits associated with solar because it is clean and renewable. However, it has financial benefits too, and those seem to have been overshadowed. 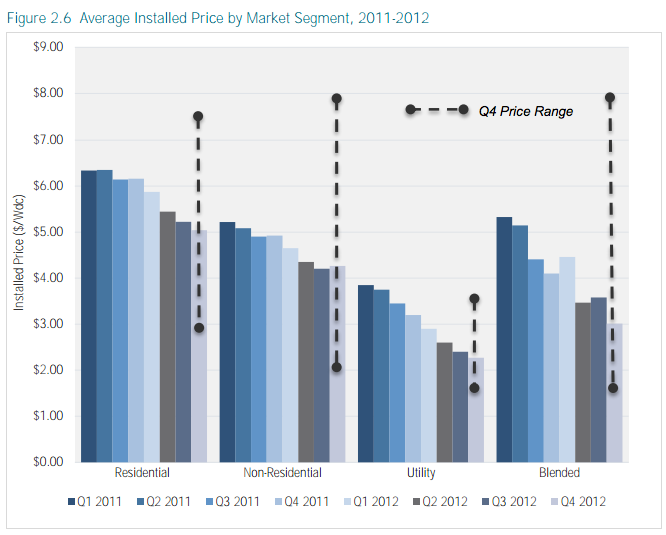 Did you know that, on average, homes with solar power systems tend to sell faster once they have been listed? In fact, an NREL study found that they might sell 20% faster. What would that be worth to you? Let’s explore just two scenarios: a new job in a different part of the country and a family emergency. If you get a better job offer in a different state or part of the country, you might need to move fast or lose it. Being able to sell your house more quickly could save you time, energy, and money. Otherwise, you might have to travel back to the home you are trying to sell and the process is drawn out. If there is a family emergency and you need to sell to raise cash, it would surely be a relief if the sale was expedited. 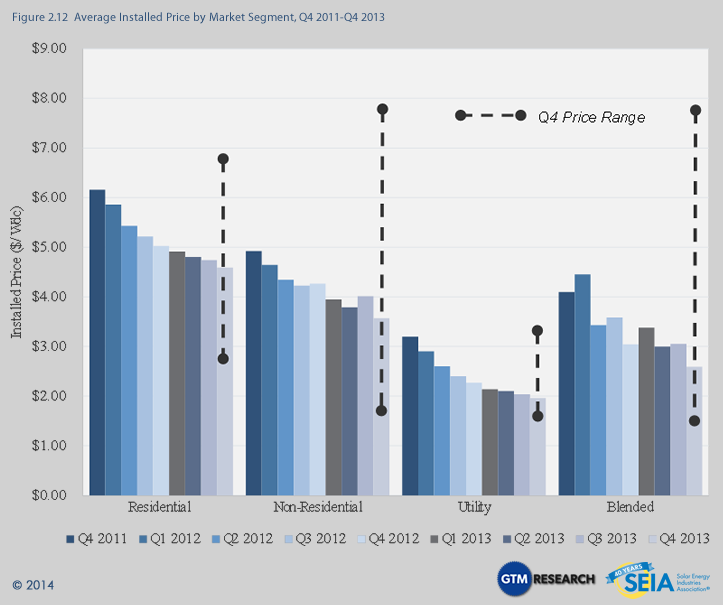 Even better, a home with a solar power system might just sell for disproportionately more money as well as sell faster. In fact, a different study found that to be the case — for as much as $17,000 more. 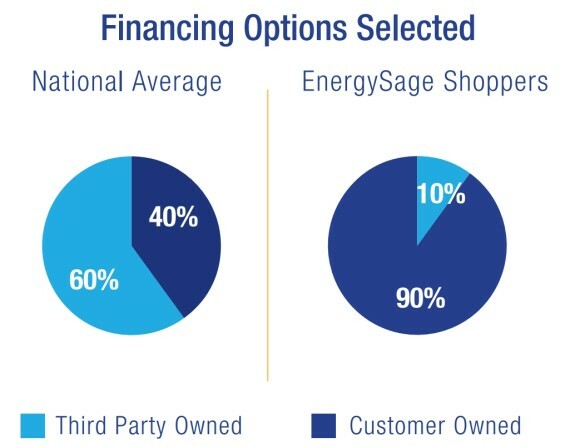 If you use the example of a home solar system that costs $20,000 before incentives and $14,000 or maybe slightly less after, then you clearly would be coming out ahead. Note this is a very different scenario than a home solar power system “costing too much.” How could it cost too much if you wind up making money? The potential financial benefits don’t end there, though. Rooftop solar power systems keep roofs cooler, so you can reduce your use of air conditioning. There is also a slight benefit during winter, because solar systems help keep heat in, though this effect is not as pronounced as the cooling. Some of the solar power information you may encounter is outdated and a portion of it is anti-solar propaganda. The truth is that solar power has never been more affordable, which means it is within the reach of more people than ever. Additionally, home energy storage systems are on the horizon and they will make home solar even more attractive. And if you drive an electric car (which has a $7,500 federal tax credit and a $2,500 California EV rebate), you can power that car with sunshine and save a lot more money. Analytics company IHS has predicted solar PV production and shipments to skyrocket through the first half of 2016. 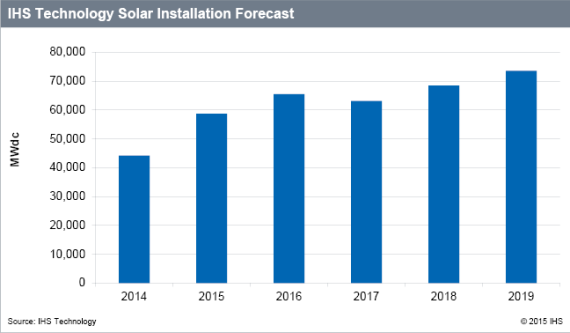 In a new forecast published Monday, IHS concluded that “installation deadlines, sunsetting solar tax credits, and other policy dynamics of the two largest global solar markets, China and the United States,” are going to push solar PV production through the roof. IHS predicts that 2015 will see an increase of 33% in global solar PV installations, reaching 58.7 GW, and though that will soften somewhat in 2016 — growth slowing to only 12%, reaching 65.5 GW — the first half of the year will reflect existing situations. Specifically, anti-dumping trade disputes in the US market will prevent prices from falling through the first half of the year. IHS warned in late-October of a potential shortage of solar PV wafers in the US market, which is also going to play a part in H1’16 production issues. “Given the current shortage, wafer prices might still rise for a few months, despite declining polysilicon prices,” said Edurne Zoco, senior manager and principal analyst, IHS Technology. Recently announced additional solar PV quotas in China are expected to be connected by June, 2016, in order to be eligible for 2015 incentives. 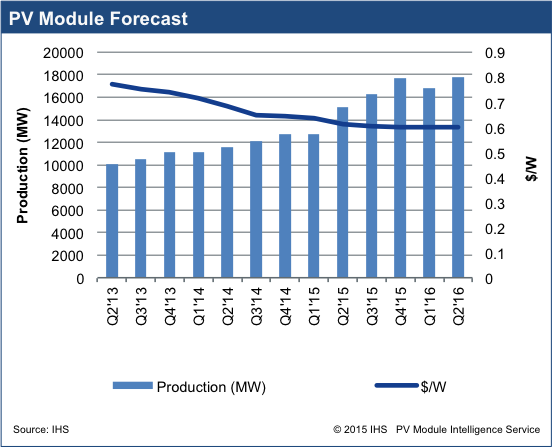 Beyond the first half of 2016, however, IHS predicts average selling prices (ASPs) are likely to fall along the module value-chain. IHS predicts a stalling of utility-scale production, which throughout 2017 will see a 7.8 GW decline in annual installations, though the remainder of the global solar PV market will continue to grow, at an estimated 11% in 2017. Shayle Kann, the director of GTM Research, is predicting the US solar industry to continue on its impressive growth streak, and to play a “meaningful role” in the future of electricity in the US. The former Fullbright scholar, who now directs GTM Research, the market analysis, advisory and consulting division of Greentech Media, is behind the latest executive briefing from GTM Research, which investigates the future of the US solar industry. Specifically, Kann envisions solar playing “a meaningful role in the future of electricity in the US” thanks in part to fallen solar costs. Solar PV System Price Forecast Through 2030, a slide from Shayle Kann’s presentation at the US Solar Market Insight event. 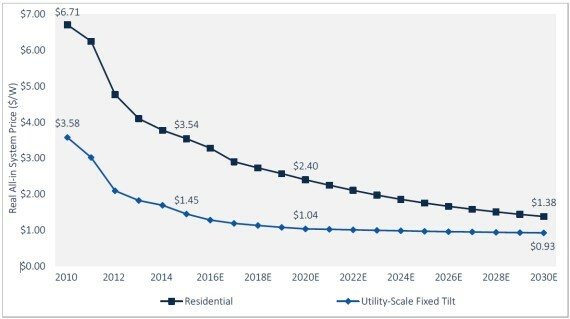 “For the solar industry,” Kann writes, “it is time to start thinking about the next order of magnitude.” Given that the US solar industry has skyrocketed from only 2 GW cumulative capacity at the end of 2010 through to a likely 26 GW by the end of this year, that could mean a lot of the US solar industry. 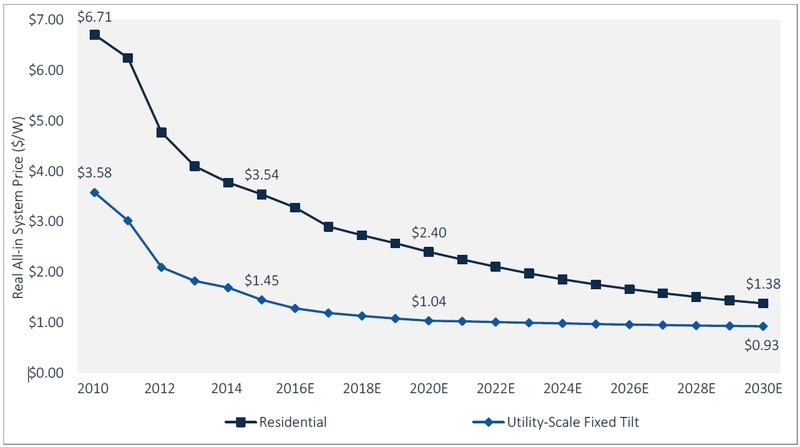 Kann believes that the US solar industry could realistically grow from contributing approximately 1% of the US electricity to 10% over the next 10 to 15 years. Which is the driving force between Kann’s executive report, highlighting “the key forces likely to push, or impede, solar growth in the coming years” and identifying “opportunities for the solar industry to ensure its future.” The report follows a presentation Shayle Kann gave at the US Solar Market Insight event, in front of more than 400 executives from the solar industry, on November 3. Information and analysis firm IHS has warned that, as a result of rapid solar installation growth in 2015, the US might encounter a potential solar wafer supply shortage in 2016. In a IHS Research Note sent out on Thursday, IHS warned that there could be “a potential solar wafer supply shortage throughout the entire supply chain” in 2016, despite the recent announcements of large capacity expansions from leading module suppliers. “There is increasing likelihood of a potential shortage of tariff-free solar cells in the United States, and several cell and wafer producers are already warning of a potential wafer supply bottleneck in the coming months,” IHS warned. The increase in global demand — which has escalated year after year, increasing 33% in 2015 to reach 58.7 GW, and which is expected to increase again to 65.5 GW in 2016 — has first affected solar module manufacturers, but is now trickling back up the supply stream, affecting first cells and wafer producers, and now, in the third quarter, polysilicon producers as well. Unfortunately, though there are expansion plans in the works, IHS believes that the wafer industry’s capacity expansions will not keep pace with the global demand for solar, due in part to the more capital intensive cost of wafer production expansions. If demand is to be met, the top 10 producers are going to have to step up, producing 43 GW in 2016. However, IHS is predicting the total production capacity of the top 10 will only reach 36 GW in 2015, meaning a hard road ahead in 2016, especially considering only two companies are currently planning to increase their capacity in 2016 — GCL by 1 GW and Longi by 500 MW, creating a 5.5 GW shortfall. The world’s top five most attractive countries for solar PV module manufacturing has received a boost from a “flurry of new module manufacturing capacity” in 2014. 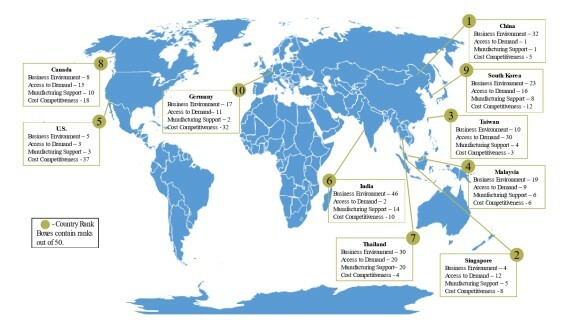 This, according to new research published by GTM Research today in its Global PV Manufacturing Attractive Index 2015 (PVMAX), which ranks the world’s most attractive countries in which to manufacturer solar PV modules. In all, the top 10 included (in order): China, Singapore, Taiwan, Malaysia, the United States, India, Thailand, Canada, South Korea, and Germany. 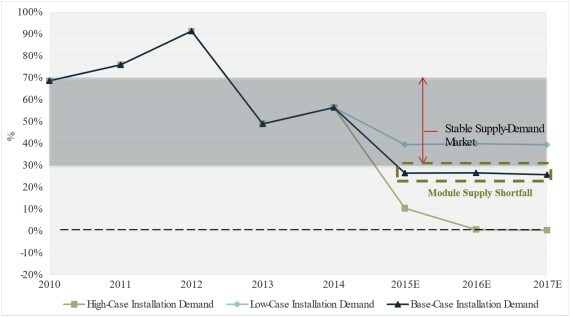 Following several years of a persistent oversupply of solar PV modules, the market is finally returning to a more stable supply situation thanks to two separate factors identified by GTM researchers: First, consolidation and facility closures have tightened supplies; and second, global PV demand is expected to increase over the following five years. In fact, GTM Research predicts that solar PV demand will reach 135 GW in 2020. This could in fact lead to a “supply crunch” by the end of the decade, as demand ramps up high enough to put a healthy strain on the supply of solar PV modules. Specifically, GTM Research is predicting an excess module capacity of only 26%, where an excess capacity between 30% and 70% would be more ideal. Global solar PV demand will reach 59 GW in 2015 due to rising Asian and US deployment rates, says information and analysis firm IHS. Fast-forward to October, and IHS has had to again revise its 2015 and 2016 estimates due to rising growth in the US and in China. Specifically, IHS is predicting total 2015 global solar PV demand to reach 59 GW, up 33% on 2014 figures, while 2016 is forecast to reach 65 GW, a revision of more than 2 GW up on previous IHS estimates for the year. Growth in 2016 over 2015 figures is expected to drop to a reasonable 12%, and total cumulative global solar PV will surpass 300 GW, in advance of a lacklustre 2017 that will be caused, at least in part, by the likely expiration of the US production and investment tax credits. Solar PV became Australia’s number one source of renewable energy in 2014, passing 4 GW of installed capacity, overtaking wind’s 3.8 GW. The new figures came by way of energy insight company, GlobalData, and its new report, Asia-Pacific Renewable Energy Policy Handbook 2015, which details renewable energy policy measures and incentives throughout the Asia-Pacific region. According to GlobalData’s accompanying press release, the report “states that renewables have become an integral part of the energy policy in Australia” — which could be argued, depending on GlobalData’s meaning here. While renewable energy is indeed an integral part of energy policy here in Australia, this is only the case insomuch as you consider the amount of time spent arguing about renewable’s place in energy policy here in Australia. There are any number of examples across Australia that show renewable energy is not an integral part of existing energy policy. Nevertheless, recent leadership changes in Australia have bolstered renewable energy’s role in the future of Australia’s energy policy and energy mix, which bodes well for the future of the industry. Despite all of the flux around Australia’s renewable energy industry over the past few years, GlobalData points to the continued growth of Australia’s solar PV industry, which in 2014 reached 4 GW of installed capacity, overtaking wind power’s 3.8 GW. GlobalData also believes that, while solar and wind will continue their role as the two main renewable energy technologies in Australia, bioenergy is next to make a move. “While feed-in tariffs and renewable energy target schemes, along with other subsidies and support initiatives, have had a major impact on the solar PV and wind industries, the impact of such programs on biopower and small hydro has been minimal,” Siddhartha Raina explains.